Hyperthermia is a promising, relatively new treatment modality for various types of cancer. The technique involves heating the tumour using electromagnetic (EM) fields, generally using antenna arrays to focus the energy. Despite its tremendous proven potential, the treatment has so far failed to gain widespread acceptance. One of the reasons could be the difficulty of administering good treatment, which involves reliably heating the entire tumour while reducing energy deposition in healthy tissue. This is due to the complexity of the applicators (antenna arrays with many degrees of freedom) and the nonstraightforward relationship between the settings and the resulting temperature distribution. A reliable treatment-planning tool could not only solve this problem but help to visualize what actually takes place inside the patient, thereby increasing the acceptance of hyperthermia. Model of a Sigma-60 applicator (BSD) in the SEMCAD X simulation environment. Treatment planning (TP) for hyperthermia involves the following steps: generating an individual patient model, simulating the EM field distributions induced by the various antennae, determining the resulting temperature increase while optimizing the antenna settings and finally calculating the effect at the cellular level. The treatment-planning tool has to permit modeling and planning with a very high level of detail, accuracy and reliability. This is necessary to reduce hotspots and guarantee good coverage of the tumour area. The Foundation for Research on Information Technologies in Society (IT-IS) and various research partners have started developing such a treatment-planning platform. The planning tool is based on the SEMCAD X software co-developed by IT-IS: a software optimized for studying electromagnetic field distributions in complex models, and induced temperature changes, especially in living tissue. Furthermore, we are developing generators and applicator hardware that enable precise computer control of the antenna array excitation, and hence heating, whilst providing reliable feedback. The first step towards generating patient-specific treatment is to have a detailed model of the patient. A toolbox is being developed that allows the flexible combination of various segmentation techniques ranging from fully automatic to highly interactive. This is necessary to enable the toolbox to work with various types of input data (CT/MRI) of potentially low quality. Furthermore, there is no general-purpose automatic segmentation method that can handle all of the types of tissues that must be identified for reliable TP. The toolbox will contain pre- and postprocessing methods to remove noise, close holes and extract surfaces. Provision of interaction types tailored to the specific segmentation methods is critical. The segmentation must be a simple task performable by technical staff in hospitals. 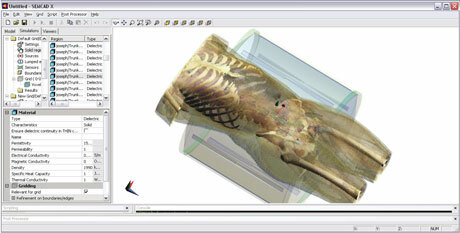 The patient model is then loaded into the simulation environment. Solvers have been developed that can handle complex models of both the patient and the applicator. Generally, the finite-difference time-domain method (FDTD) is used, as it is ideally suited to these types of inhomogeneous models. Dedicated FDTD hardware accelerator cards are used to reduce the simulation time. Special techniques such as conformal subcell models, ADI (Alternating Direction Implicit) and transient excitations are employed to reduce numerical errors and speed up the simulations. Since it is the temperature increase that causes the increased cell death in tumours, it is important to determine not only the EM field but also the temperature distribution. The main challenge here is to correctly account for perfusion cooling. For this, the bioheat equation with temperature and time-dependent tissue parameters is solved. However, in order to account for the discreteness of blood vessels and the directivity of blood flow, an improved model is being developed. It couples the continuous 3D simulation to a pseudo-1D simulation of the vessel tree and uses information about the location and orientation of the nearest vessel to determine a tensorial effective heat conductivity. Various methods for quantifying tissue damage are being studied. These include using an Arrhenius model that can account for the transient behaviour of the temperature increase and a CEM43 dose concept. Finally, a fast and generalized eigenvalue method is used to determine the optimal antenna steering parameters. Both temperature and EM energy distributions can be optimized. Multiple targets can be assigned individual heating priorities, and sensitive regions can be specified. Information about hotspots (both simulated and experienced by the patient) can be used to come up with a modified treatment plan. A cooperative effort with the Computer Science Department of the University of Basel is exploring new possibilities arising from recent advances in nonlinear optimization. A new interior point method will be devised that will allow the optimization of nonlinear models for temperature increases on large rectangular grids as they appear in FDTD. Together with the hyperthermia unit of the Erasmus MC in Rotterdam, the practical use of such a treatment-planning tool is being explored. An additional collaboration is studying the development of new applicators and the use of simulation software to help create new devices. To validate the planning software, extensive experiments are planned. These will include building phantoms and measurement devices as well as using MRI thermometry to monitor the treatment of real patients. Close cooperation with the University hospital in Geneva and the MRI group of the Kinderspital in Zürich has been established. It is hoped that these advances in the reliability of treatment-planning software will increase the quality of hyperthermia treatments and encourage physicians to apply the technique more widely.